A stunning sterling silver ring.inlaid with a Mystic Topaz. Stone: Mystic Topaz. Material: Sterling Silver. Sterling Silver tarnishes on prolonged exposure to air and water. Do not use abrasive cleaners or liquid cleaners. Ring--sz7, sz8--Blue topaz in winding silver vine band--such beauty! I have this rings in sz 7 and also in about an 8.25--Just a gorgeous new ring! NEW ARTISAN HANDCRAFTED. 925 STERLING SILVER BLUE TOPAZ RING. Teardrop Blue Topaz ~ Bezel Set. SURROUNDING EACH ARE EIGHTEEN SPARKLING CZ'S. IT IS PRE-OWNED BUT IS IN VERY VERY NICE CONDITION, READY TO WEAR! BEAUTIFUL JUDITH RIPKA. STERLING SILVER RUBY & DIAMOND. BAND RING! The digital images we display have the most accurate color possible. Antiqued Silver Tone Topaz Ring. Stone is set in a flat round with deco hearts surrounding it. Has a sturdy stretchable band being size 7 unstretched. Can be stretched to a size 10 comfortably. 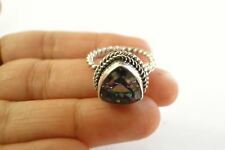 Handmade Sterling Silver .925 Bali Solitaire Gem Band Ring w Feather Accents. 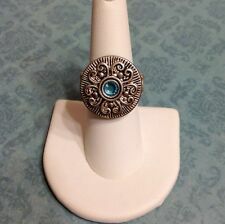 Handmade Sterling Silver .925 Bali Band Ring w Blue Topaz, Blue Mabe Pearl. The band is convex with the ends curving up. A faceted rectangular amber topax stone, about 13mm by 9mm, is prong set in a big raised basket setting. The depth of the setting is just under 1/2". It is marked "Sterling". Great 9K Yellow Gold Silver filigree Blue Topaz Ring size 7 (s r1662. The band is made of filigree sterling silver with 9k Yellow gold rims and square 6mm x 6mm Blue Topaz. A fabulous sterling silver band ring. ).